This is Marzi, the most popular introvert on the interwebs. Marzi, being an introvert, isn’t a fan of being the centre of attention. But she’s gaining popularity by creating honest, heartwarming and relatable comics that people love. And if you’re an introverted personality like me then you’ll immediately love Marzi and her awkward moments that she shares with the world. Who’s an introvert? Well, if you experience awkward conversations on a daily basis, or have been at a social event and thought you’d rather be at home with your cat, or basically just avoid human interaction as much as possible, then you’re not alone. 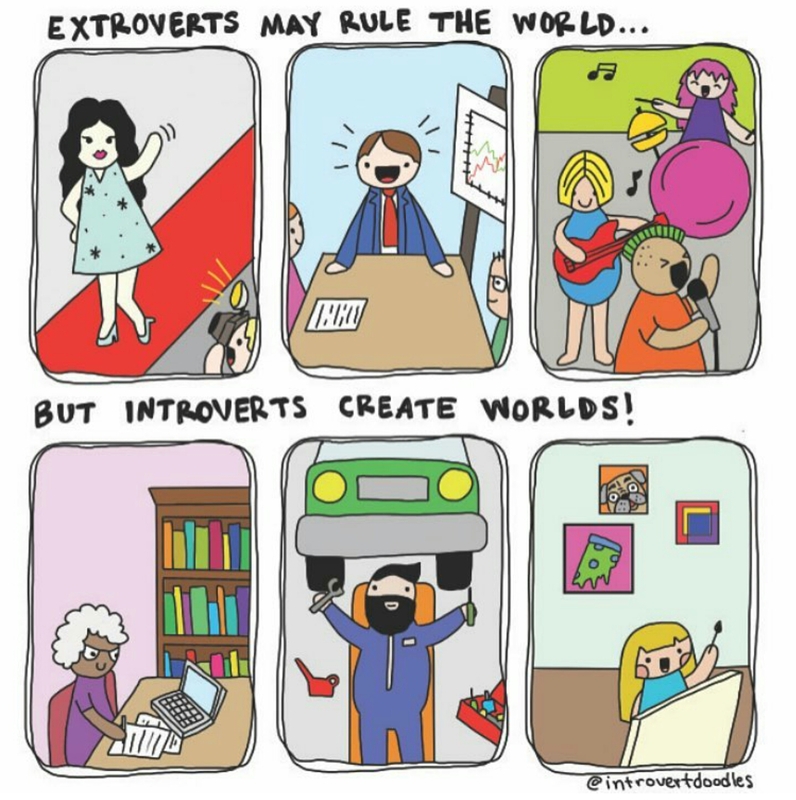 Welcome to the introverted world! There’s plenty of us here, even some peeps that you would never think to be in the introverted category are here too and it’s nice to know that you’re not alone with all the bumbling awkwardness. I love that I’m an introvert. I have no problems saying that I would much rather be at home in my pjs than at a glittering event with all the bells on. I do, however, sometimes enjoy socialising with people who I feel comfortable around, which makes me an extroverted introvert. This is quite common. But I really do love my alone time and how it gives me a recharge so I can then get back out there and function properly each day in the human world. 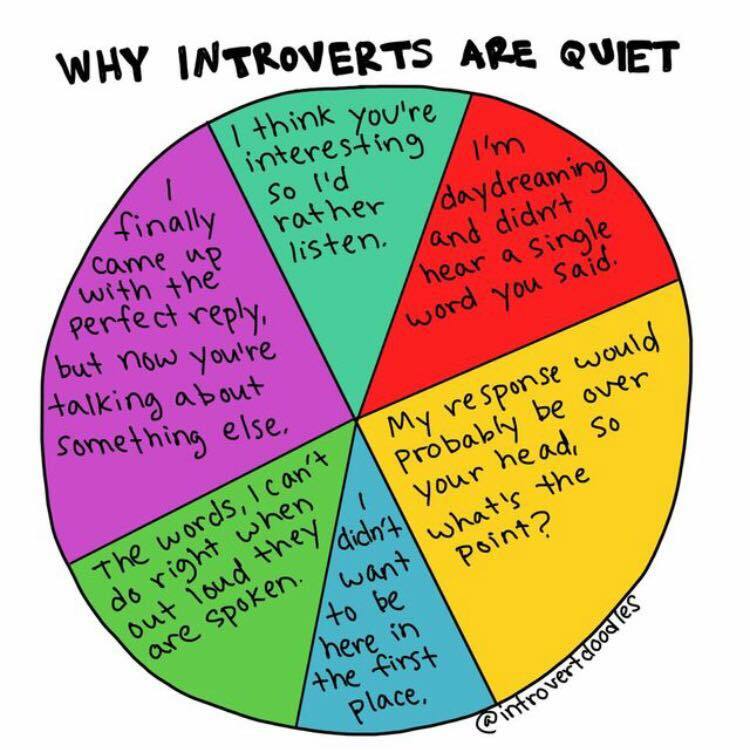 A lot of people don’t understand introverts and can’t work out how to deal with the personalities, which can be quite challenging for some extroverts to comprehend and can also leave some introverts feeling weird and self-conscious. We can be quite reserved at times and don’t express ourselves very well, which is why we generally voice our feelings through creativity. We can get frustrated with people who are overbearing or don’t think the same way as us but we would never say anything for fear of hurting their feelings. Hence why we need those precious quiet and alone times to get back on track. It’s a tricky way to be but we are a special, awkward breed and we should be celebrated… alone, in our own homes, with pizza (online ordered then delivered = minimal human interaction) and a good book. So how about our dear friend Marzi then? 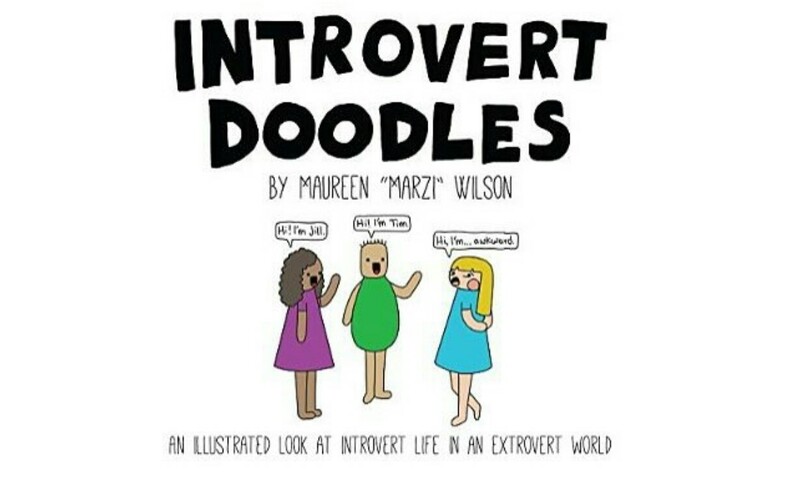 Classic introvert Maureen “Marzi” Wilson from IntrovertDoodles, creates cute comics illustrating the daily struggles of an introverts’ world. Marzi’s comics are humble, funny and relatable to so many people. 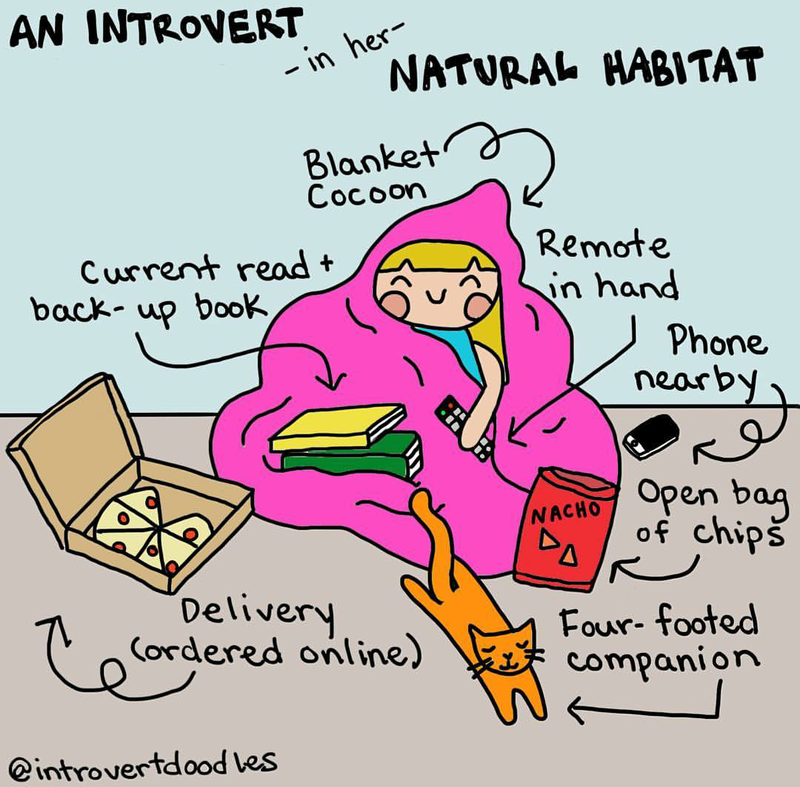 Her comics have appeared on sites such as BuzzFeed, HuffPost and Mamamia and she’s even signed a book deal, Introvert Doodles: An Illustrated Look at an Introvert Life in an Extrovert World, which is being released in December, meaning you now know what to get the introverted person in your life for Christmas. Welcome, Marzi! 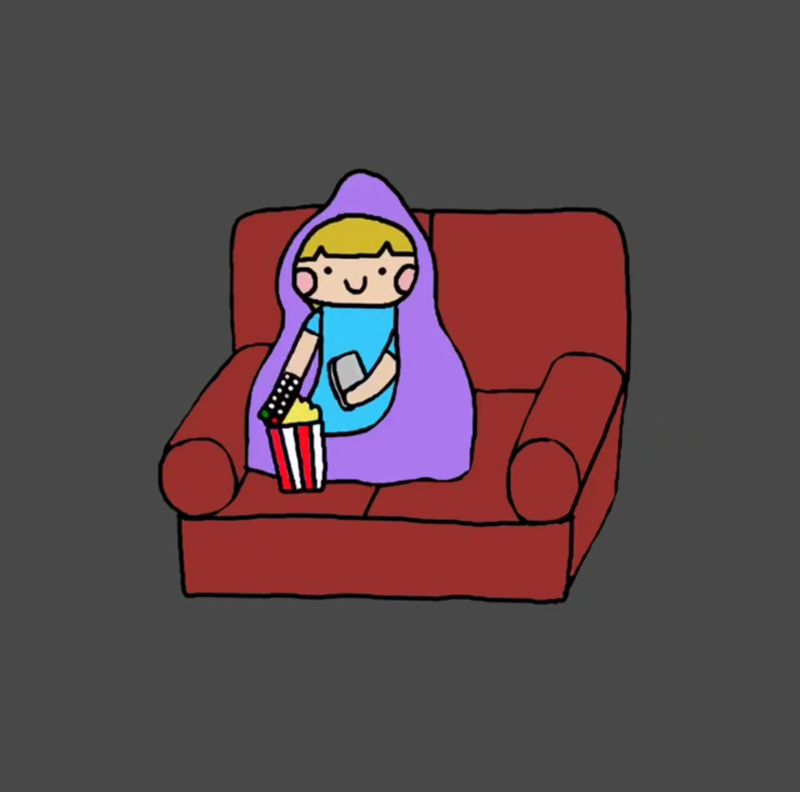 Tell us a little bit about what you do for a living aside from IntrovertDoodles. I have a DIY YouTube channel and website, MadeByMarzipan.com which I’ve had for 10 years now. I used to be a project designer for my local craft store… I would take materials home and make a project for store display. But whenever I went in to drop something off, there would be a stack of questions from customers wanting more details on the process. But, classic introvert that I am, I really didn’t want to call all those strangers! So I decided to start a blog with instructions for my projects. It just evolved from there, and now I work with art supply companies throughout the US and make video tutorials to teach people how to make art and craft projects. So if you like crafting, sewing, or hand lettering, go check it out! 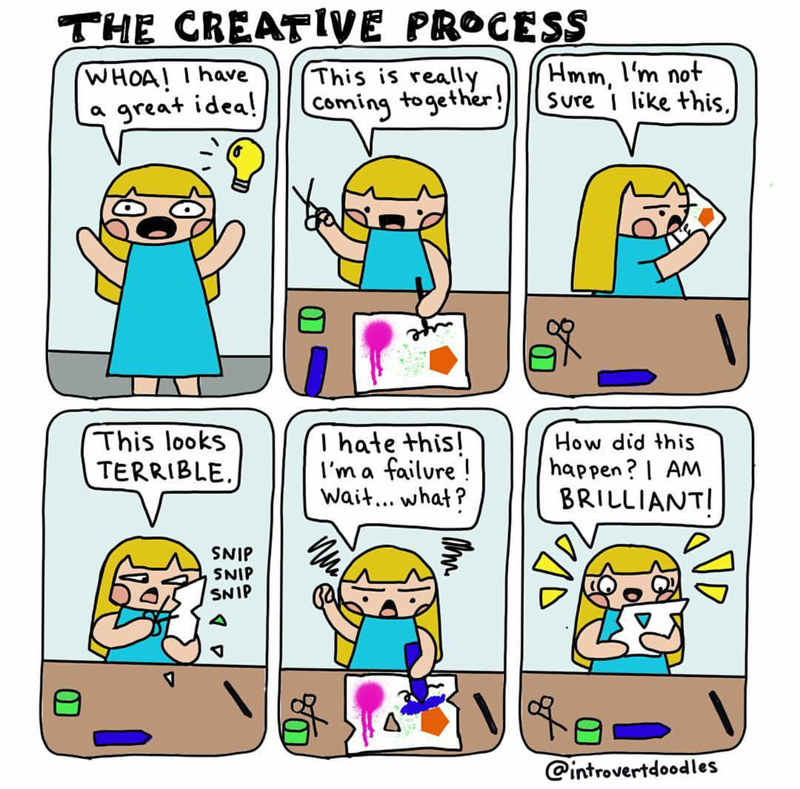 You have quite a large following on the IntrovertDoodles Instagram (66,000) and Facebook (70,000) pages. How long have you been drawing your Marzi doodles for? Is this something you’ve done as a creative outlet since you were young? I’ve been doodling since I was a little girl. I plastered the walls of my bedroom with drawings! But Marzi and IntrovertDoodles started last year  with the Instagram account first in August and then the website in September. The first few doodles were posted on my MadeByMarzipan Instagram account. But when the posts started getting more interaction, I realized that not everyone who was interested in the comics would be interested in my DIY posts, and vice versa. So I decided to make a separate page for Marzi, and that’s when I decided on the name IntrovertDoodles. And then I just happened to get lucky with publicity so it gained some traction from there. BuzzFeed used one of my comics in an article, and that caught the attention of other news apps like HuffPost and PopSugar. How did the inspiration for Marzi and her stories come about and suddenly become an online hit? 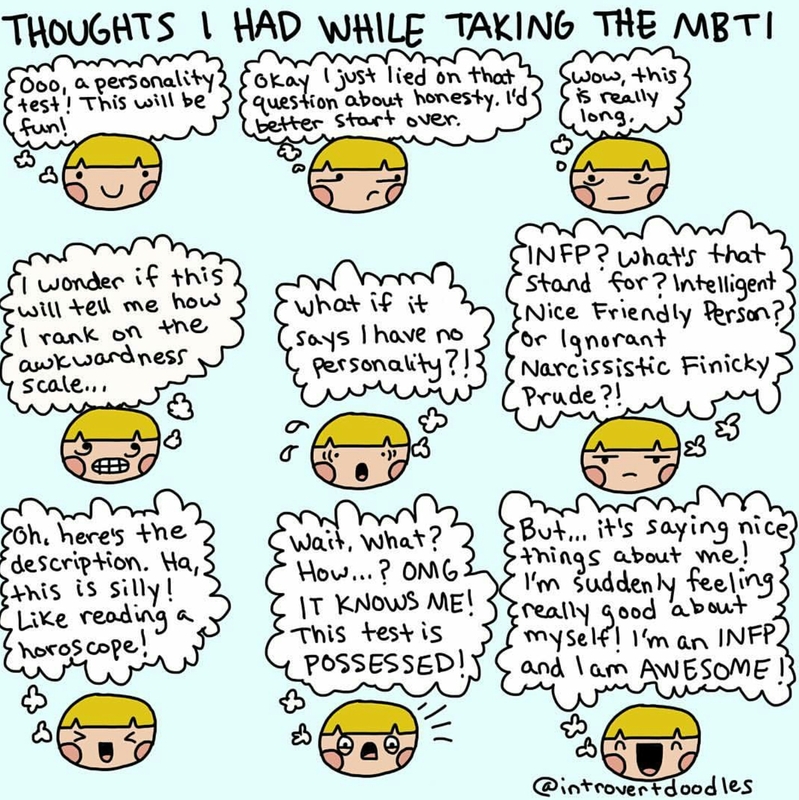 One day I saw an article about the Myers-Briggs Personality Type Indicator, and I was curious about it. So I found a free quiz on 16personalities.com that’s based on the MBTI. When I learned about my type, INFP, I felt like I’d found the missing piece of my puzzle. I realized that I’d been focusing on my “flaws”- being too sensitive, too quiet, too dreamy – without recognizing that they were part of a bigger picture. Yes, I’m all of those things, but being sensitive also means that I’m empathetic and intuitive. Being quiet means I’m a good listener. Being dreamy means I’m creative and thoughtful. I finally saw myself as a whole, complete person. My mind was racing with all the implications of this, and doodling was my way of processing these ideas so I put them online. I was surprised when other people connected with them! Your fans are so encouraging and interactive. Almost all of the comments are people realising that they’re not the only one that has these feelings and it’s ok to be different. They’re not alone or weird. How do you react to that? Do you feel a sense of pride and achievement knowing that people genuinely like your work and it’s relatable? I’d say it’s been therapeutic for me. It’s an affirmation that I’m okay, just as I am. I can put out my most awkward moments, my fears, silliness, and worries, and my internet buddies accept and support me through all of it. When you’ve spent your life wondering, “what’s wrong with me?” it’s healing to have that sort of reassurance. I do like to get emails from my followers, telling me that my little drawings have touched their lives in some way. I feel honoured and grateful that they would take the time to reach out to me. When you first started putting the doodles online, did your family and friends know it was you? Or did you want to keep that a secret for as long as possible? The doodles started on my MadeByMarzipan account, so my followers there knew of the connection. However, few people in my real life know about MadeByMarzipan either! It isn’t a secret, but it isn’t something I bring up unless someone asks. Do you create all your drawings with the old pencil and paper or are you now using all the fancy new technology and programs to create your masterpieces? I started out hand drawing them, but got an iPad Pro in January, so I switched to digitally drawing with an Apple Pencil. Are you finding this is a better way to work or would you prefer to stay old school? Well, I have a filing cabinet full of original doodles, so I think storage would have been an issue if I’d kept going! I think the iPad is the best of both worlds, as I’m still drawing by hand, but I can store and transfer high-res images quickly. It certainly made things easier when it came time to edit my book! Yes, your book is coming out later this year! How exciting! Was that an idea from the beginning or did that pop up along the way? After several months, I had followers asking for a book collection. But sadly, I had no connections in publishing, and I didn’t know how to make it happen. Again, I just got lucky, when an editor from Adams Media came across my doodles and offered me a book deal. They’ve been amazing to work with, and I’ve had so much fun bringing this project to life. It has 175 pages of my favourite comics, plus new ones you won’t see anywhere else! After my chat with Marzi, I (of course) wanted to find out where I sat on the Myers-Briggs Personality Type Indicator, so for a bit of fun I went to 16personalities.com and took the free quiz. Turns out I’m a INFJ (advocate) type which is believed to be the rarest of them all on the personality spectrum, making up less than 1% of the population. Well there you go. How interesting. Curious to find out yours? Head to 16personalities.com and do the quiz… and if there’s any other INFJ’s out there let me know. We’ll start a gang. Cool article, subtle, perfectly vague yet enough said to get an armchair visual of our favorite introvert comic artist. Such a nice article, thank you for putting this together! And hello, there, fellow INFJ! Yaaay another INFJ buddy! Great quiz isn’t it. Really does make you think it was written specifically for yourself! Such a great article!!! 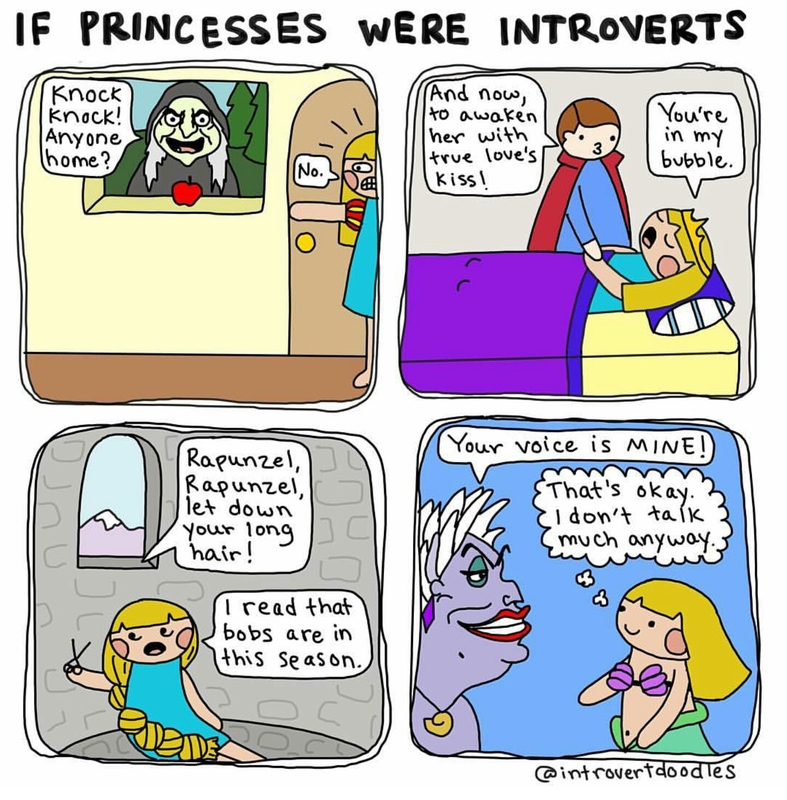 as a fellow introvert bravo! Welcome to the club, Thea! You are definitely not alone, we all feel the same 🙂 Keep smiling!